The Air II™ Station is a custom designed breathing air regulator system capable of flowing 4,500 standard cubic feet per hour. By replacing air bottles being brought directly to a work area, it eliminates the need for forklifts, dramatically decreasing interruption and increasing tool time. 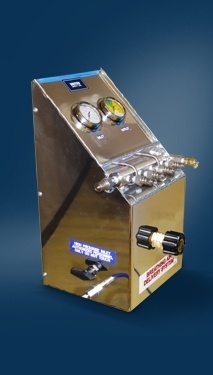 The Air II™ Station is available in versions of five or eight users, and multiple Air II™ Stations can be connected together to support larger crews. Additionally, because total pressure stored and local discharge pressure are visible in each Air II™ Station, it eliminates the need for separate bottle watch. To find out more about the Air II ™ Stations, request a product demonstration here.